Dozens of cattle deaths have sparked a state-wide investigation. 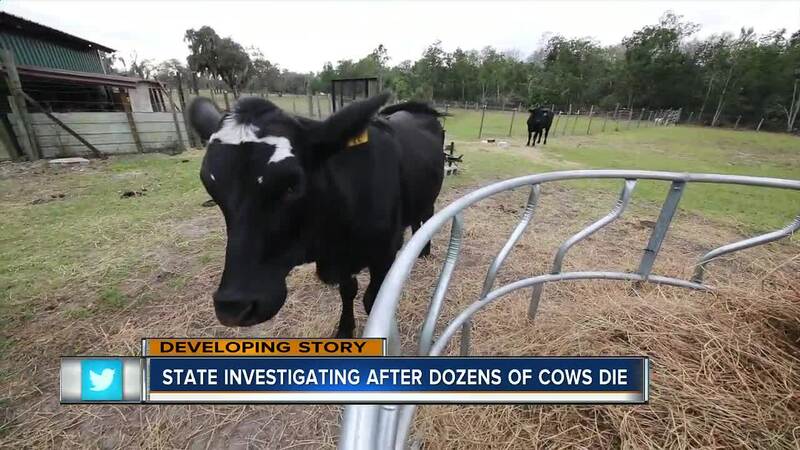 POLK COUNTY, Fla. — Dozens of cattle deaths have sparked a state-wide investigation. A Polk County man believes his cow was one of the first to die after eating Producer’s Pride cubed feed by Purina. “We had 9 before this occurred,” Gary York says. On New Year’s Eve he fed three of his cattle the Producer’s Pride. The farmer, who likes to raise cattle for enjoyment, says he noticed the bag seemed harder than usual but says he didn’t pay much more attention to it other than that. But after a few hours he noticed three of his animals weren’t acting right. “I noticed our cattle were staggering around as if they were intoxicated,” York said. A cow, which had just given birth 8 days, had eaten the most out of all the cattle. The 1,500 hundred pound animal went down and wouldn’t get up. York called his Veterinarian, who just happens to work next door, Lujean Waters with Heartland Large Animal Services. "They started displaying signs of seizures and muscle tremors,” Waters said. She has three clients she's worked with in the last several weeks who reported the same problems with the same line of feed. But waters says she believes York’s was the first case reported to the state. “We thought it was an isolated incident at that time,” she said. Since then, ranchers in 10 different counties across Florida have reported sick or dead cows. That includes a Fort Mead farmer, Jason Devane, who lost 12 cattle and also reported feeding them the same type of cubed feed. The feed in question was sold through a number of retail stores operated by the Tractor Supply Company (TSC). It was manufactured for TSC by a feed mill located in Mulberry, according to the Florida Department of Agriculture and Consumer Services Division. For many farmers, it will be a heavy financial hit, as each head of cattle can cost upwards of $5,000 because of it’s meat products. For Gary York, his loss is like losing a pet and the security of safe food for his animals. “Whatever was in that feed was too toxic for her,” he said. According to the Florida Cattlemen CEO, Jim Handley, there are currently tests being done on the dead cows as well as the feed used. Results should be back within the next week.